Blogging will be even lighter than usual for the next two weeks … I am doing some traveling and going to see some rocks I’ve been wanting to visit for several years. More on that when I return. 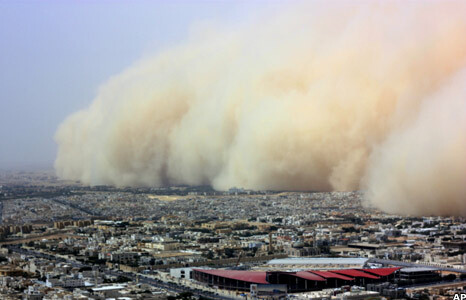 Before I leave, I’ll leave you with this image of a recent sand storm in Saudi Arabia … which reminded me of something. It’s not just a visual thing- At least in the dust storms that I’ve been in here in Oz, the dust is blown in by the cold front, so it is in a discrete denser layer of fluid. Usually in my case, the pictures aren’t as good because the cold front triggers T-storms, but I’ll see if I can find anything decent.